Peak Oil Debunked: 69. WILL PEAK OIL MAKE GROWTH OF ALTERNATIVES IMPOSSIBLE? 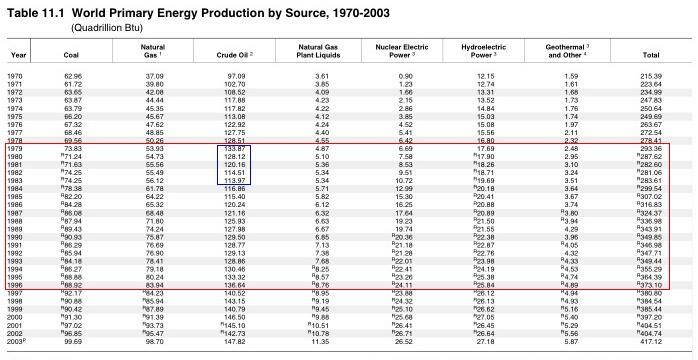 The following Table and graph come from the DOE's Annual Energy Review 2004 (P. 298, 299). (It's probably best to open each of these images in a separate window to follow the explanation below. The data in the Table can also be accessed in HTML here). Total drop over 5 years: -14.8%. Now, look at the figures for coal during that same period. Coal figures did drop by 3.5% in 1980, but afterwards they resumed growth. Total growth for coal over 5 years: +0.6%. Natural gas grew steadily throughout the period (except for a slight drop in 1982 of about 0.1%), achieving a total increase of +4% over 5 years. NGPL grew steadily, rising +10% over 5 years. Nuclear power boomed, rising +60% over 5 years. Hydroelectric grew steadily, rising +11% over 5 years. Geothermal and other boomed, rising +42% over 5 years. Total energy did, indeed drop over 5 years, by -3%. 1. A severe drop in world oil production does indeed cause a drop in total energy, although the drop is greatly attenuated due to growth in other energy sources. 2. The doomers claim that growth of alternatives (like gas and coal production, or construction of nuclear plants) will be impossible in the post-peak period due to their dependence on oil. This clearly does not accord with the data. World nuclear power, for example, grew +60% as oil fell by -15%. World oil production was 133.87 quads in 1979, and that figure was never reached again until 1996 when production reached 136.64. This is illustrated in the above graph by the bright green line (at the top, which I added), and in the table by the red box. Net growth of oil production from 1979 to 1995 was -0.4%. Net growth of total energy, on the other hand, was 27%. 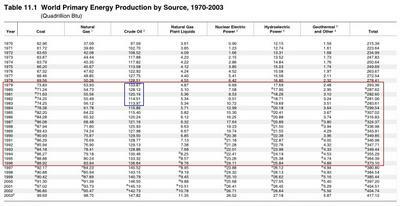 Growth in total energy does not require growth in oil production. Also, if economic growth requires growth in oil production, how is it that the world economy grew during the 1979-1995 period, despite no net growth in oil production? In fact, if you look at the graph, the bright green line can be taken as indicating flat-lining oil production for 16 consecutive years. The doomer "economists" inform us that flat-lining oil production would crash the global financial system because the financial system needs growth to survive, and that growth can only be achieved through growth in oil production. Notice, however, that in the 16 years from 1979 to 1995 the world produced less total oil than the flat-line. So why would a flat-line over 16 years crash the financial system, if producing less oil than the flat-line over 16 years did not? I've noticed that you don't mention the peak of natural gas, which is predicted to occur 20-25 years later than PO. I think it would be a good idea to incorporate that prediction to your analysis. Thank you, fernando. You make an excellent point. I am focusing mainly on oil right now, but I think often about peak gas and peak coal. In fact, I think those peaks present a much greater danger, and the seriousness of depletion could be better understood by focusing on them rather than the hype surrounding peak oil. In a way, peak oil is a red herring. "I've noticed that you don't mention the peak of natural gas, which is predicted to occur 20-25 years later than PO. I think it would be a good idea to incorporate that prediction to your analysis." Seems that it's only five years later and not only is peak natural gas not going to happen in 20-25 years, but due to the hundred year glut of shale gas we have, it's likely that we could mitigate easily by swapping some transport to nat gas and the rest to electric, enough to compensate for any putative declines. Sorry McPeaksters no cigar on this one.